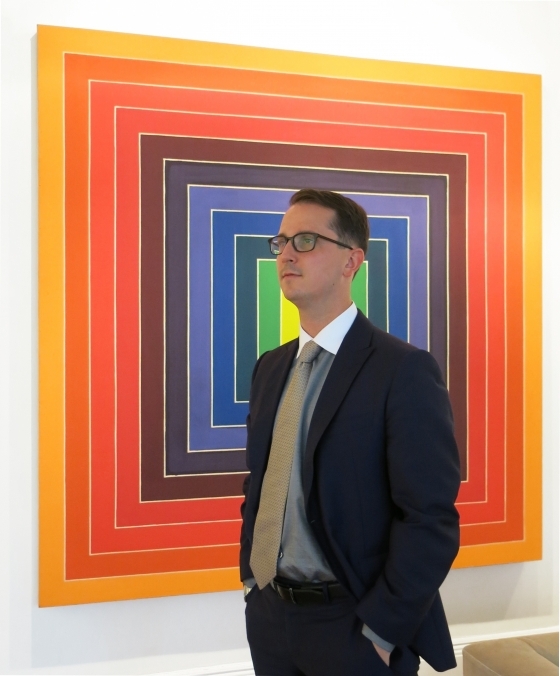 In just two years as an Artsy gallery partner, Leslie Feely Fine Art is making more than 50 sales a year on the platform. How did the gallery develop its online presence to align with its established brand and to grow its business? 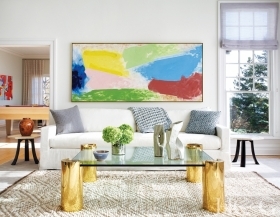 "Step Inside an Art Lover's Vibrant Shinnecock Hills Home"
In the living room, a painting by Friedel Dzubas hangs above an RH sofa, which is flanked by circa-1950s Harvey Probber side tables. The vintage brass-legged cocktail table is from Lobel Modern and the area rug is from ABC Carpet & Home. "Fridel Dzubas |Sketches" presents 30 sketches Dzubas made as either studies or small paintings for his large-scale works or murals. 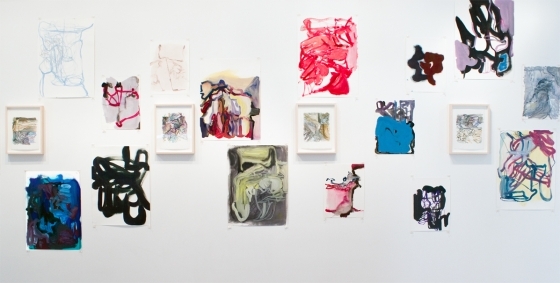 The exhibition is unusual in the breathe and number of sketches gathered and presented for the solo show, according to gallery director Dakota Sica. The sketches on view include those made in preparation for paintings that drew fame or auction attention. Brimming with art and 1950s furniture classics, the historic Manhattan apartment of American painter Robert Kelly has been transformed into a private and creative retreat. "Fresh off a well received solo show at New York's Leslie Feely Gallery, Thomsen talked to us about her latest body of work, how her process and approach has evolved over the years, and what she plans to tackle next." 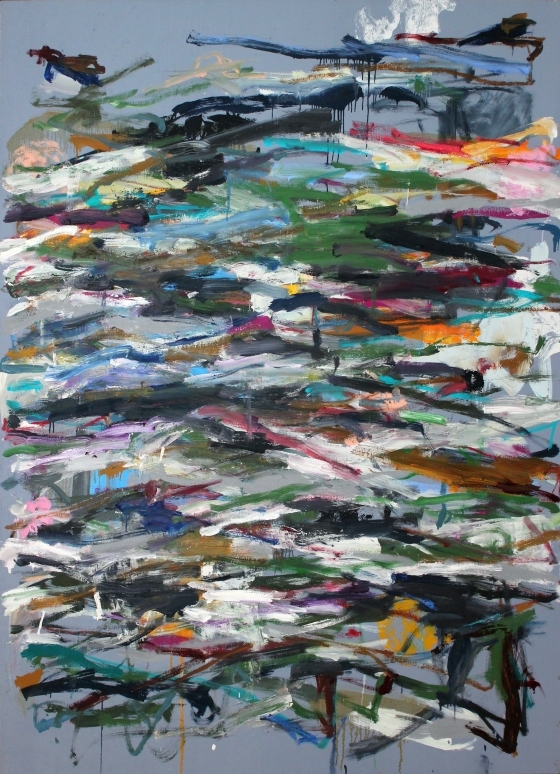 When you hear the word “brushstroke,” you probably think of color and texture, of paint applied to canvas in gestural motions. 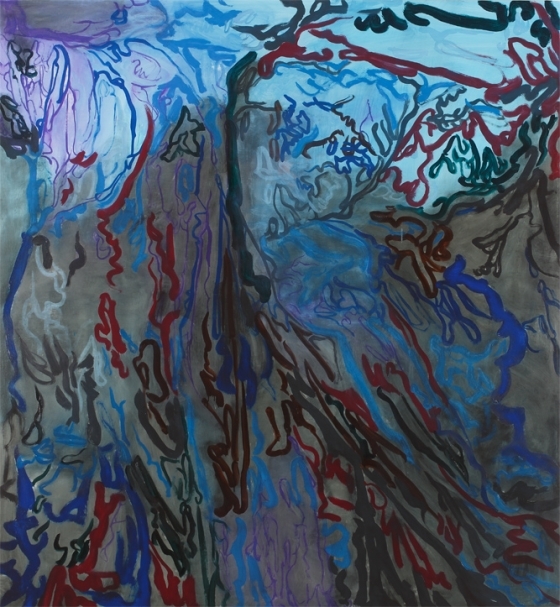 But “Strokes,” a new exhibition at Leslie Feely in New York, defies that expectation. This is not a good year for modernism. But life is short and art is long. 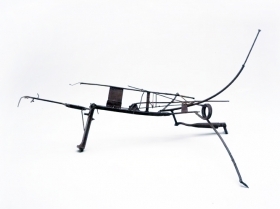 Kikuo Saito, who died last February at 76, is being honored by two exhibitions. 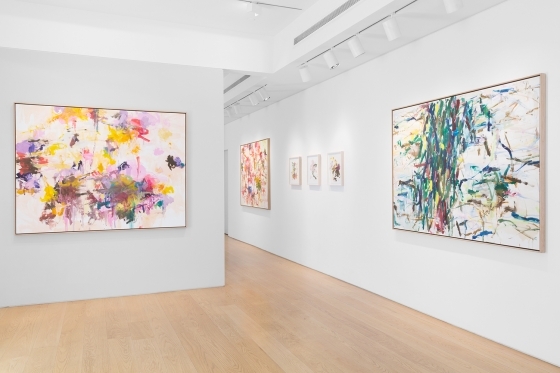 At Leslie Feely in Manhattan is“Kikuo Saito: “The Final Years” (through October 14) and at Sam & Adele Golden in New Berlin, NY is “Kikuo Saito: Color and Drawing” (through March 24, 2017). 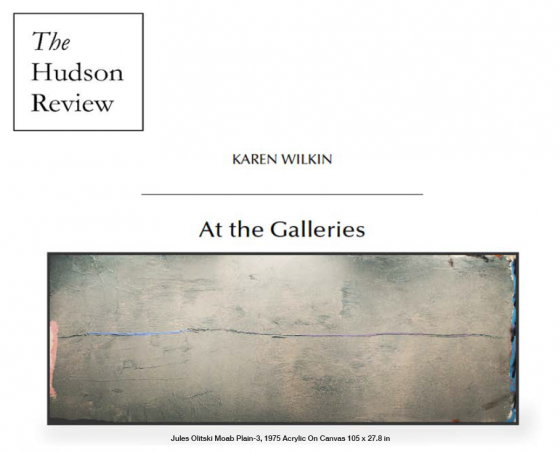 “It’s hard to resist seeing an artist’s final works as a summing up,” writes the critic and curator Karen Wilkin, “if not of everything that came before them, then, at least, of his preoccupations over his last few years.” Wilkin’s thoughtful essay accompanies “The Final Years,” a new exhibit of paintings by Kikuo Saito (1939–2016), the Japanese-born painter, set designer, and theater director who died this past February. 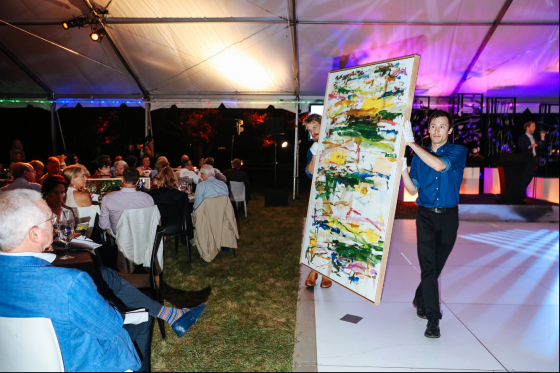 A work by Kikuo Saito auctioned at the Guild Hall gala. 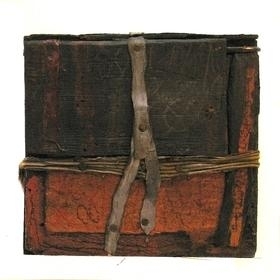 "Hannelore Baron's delicate, scorched-looking Wunderkammern feel as though they were salvaged from hell..."
Hannelore Baron’s found object wooden box assemblages look like they’ve experienced wear and tear because her family and their shop experienced the trauma of Kristallnacht, and Baron considered worn or splintered items items that have survived and prevailed. 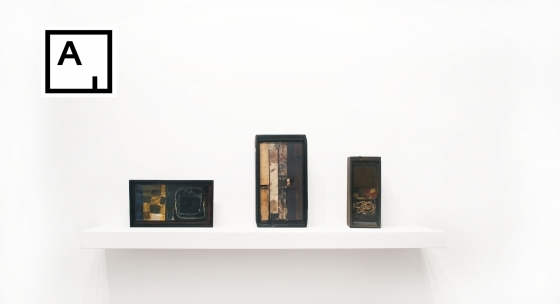 Hannelore Baron’s sculptural hodgepodges—assembled from wood scraps, personal belongings, and other refuse—reflect the losses she experienced as a child during Hitler’s regime: before her family escaped Germany, their textile shop was destroyed and their home ransacked during Kristallnacht. 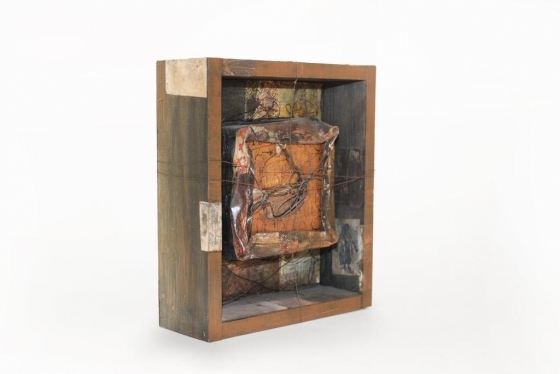 The dark, fetid-looking assemblages of the reclusive Hannelore Baron (1926-1987) were made in the security of her Riverdale, Bronx, home but are saturated with a sense of panicked fatalism instilled by the Holocaust, which she had narrowly escaped. “The Keeper” is an exhibition dedicated to the act of preserving objects, artworks, and images, and to the passions that inspire this undertaking. A reflection on the impulse to save both the most precious and the apparently valueless, it will bring together a variety of imaginary museums, personal collections, and unusual assemblages, revealing the devotion with which artists, collectors, scholars, and hoarders have created sanctuaries for endangered images and artifacts. This exhibition will encompass a multi-floor presentation dedicated to the act of preserving objects, artowrks, and images. The League mourns the loss of longtime instructor Kikuo Saito, who passed away on February 15, 2016 at the age of 76. Originally from Tokyo, Japan, he moved to New York City in 1966. 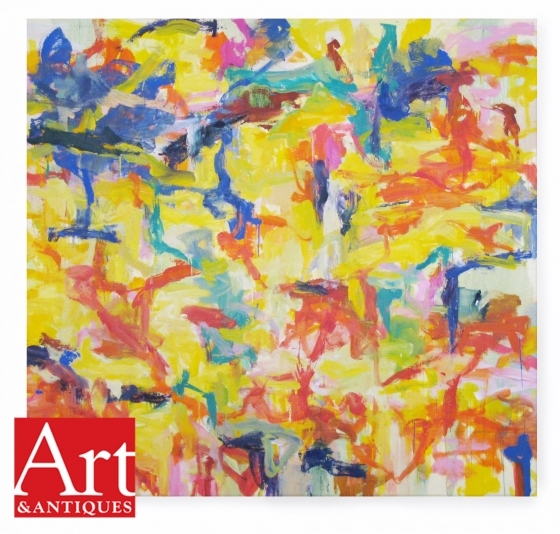 He studied at the League, and also worked as a studio assistant for Helen Frankenthaler, Kenneth Noland, and Larry Poons. 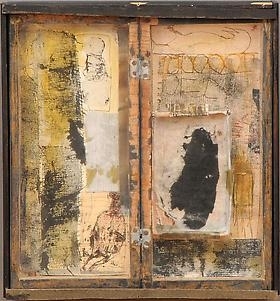 In 1976, Saito began to exhibit his own work. 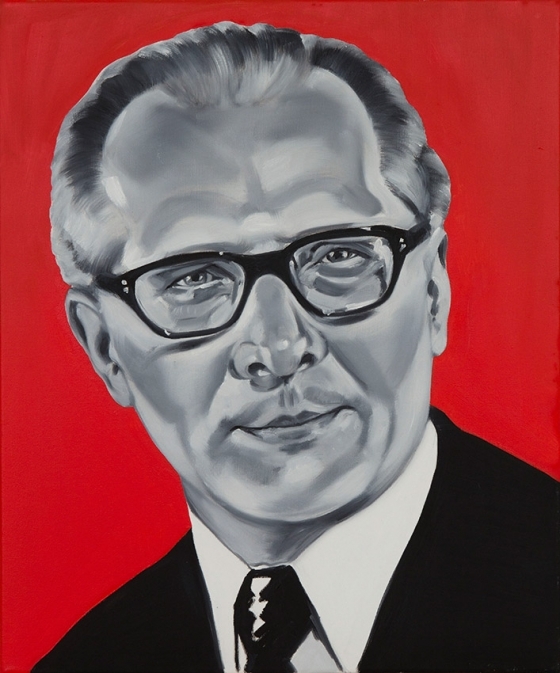 He also worked as a theatre designer for many noted directors, and later directed his own plays. 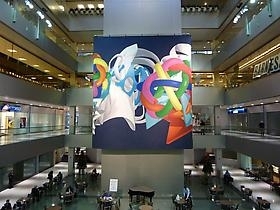 In 2005, Saito began teaching painting and color composition at the League. His harmonious paintings combine a heightened color sensibility with calligraphic strokes, and occasionally stenciled letters, alluding to his varied artistic influences. 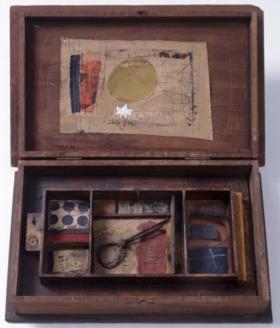 Personal yet resonant on a universal level, Hannelore Baron’s collages and box works are ever-intriguing. Her raw style is distinct and vastly different from piece to piece, as proven in a series of previously unseen works on display at Leslie Feely Gallery in New York. 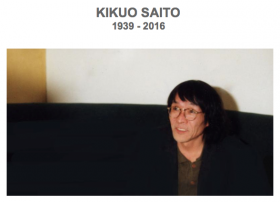 Leslie Feely is deeply saddened to announce the passing of artist and longtime friend Kikuo Saito who died peacefully Monday, February 15, 2016 in New York, surrounded by his wife, Mikiko Ino, family and friends. 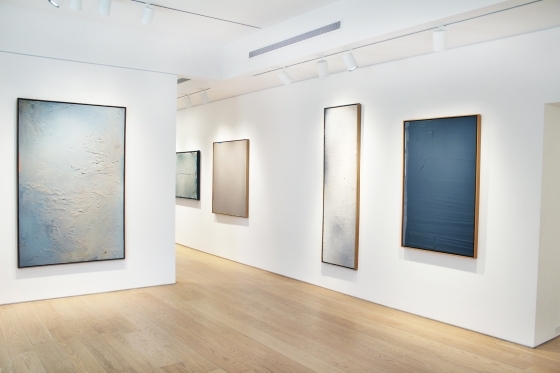 "Jules Olitski: On the Edge, A Decade of Innovation," at Leslie Feely, was similarly revelatory. 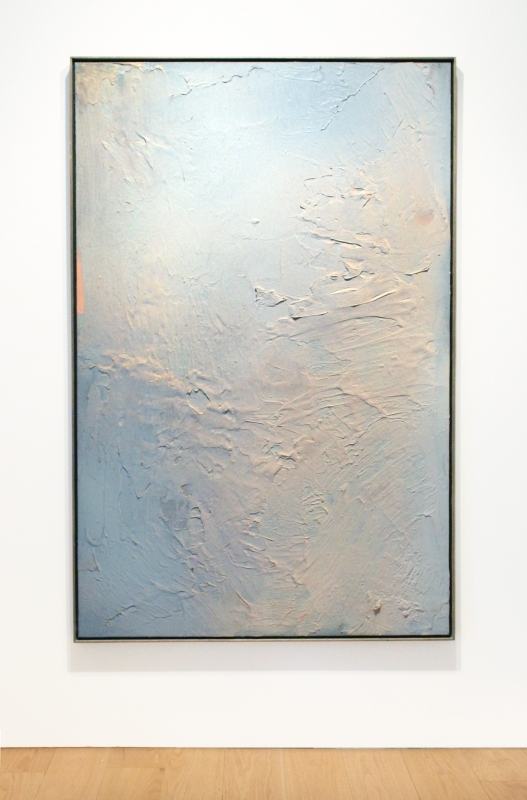 A fine selection of Olitski's delicately modu- lated paintings from the 1970s revealed his exploration of elu­sive surfaces, subtle hues, and tonal variations. Feely quotes Olitski as saying, ab out works of this kind, "I was trying to extend Rembrandt's use of flowing paint, his chiaroscuro, and just as much, his impasto into modern painting." 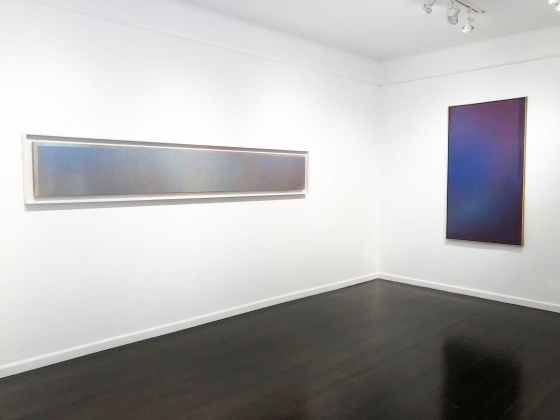 A suavely fabulous show at Leslie Feely is “Jules Olitski: On the Edge – A Decade of Innovation” (through January 16; closed December 24 to December 28, and December 31-January 1). The decade referred to in the career of this still underrated, perhaps difficult master is the 1970s (14 magnificent paintings on view are dated 1972 to 1978). 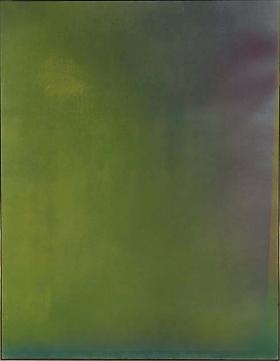 During this period, Olitski—an abstractionist born in Snovsk, but raised mostly in Brooklyn—was moving on from his “spray” paintings of the later 1960s, but had not yet arrived at his “baroque” period of the 1980s, when he would lather on quantities of gel. Tonight in Ithaca, New York, an unparalleled illustration takes flight. 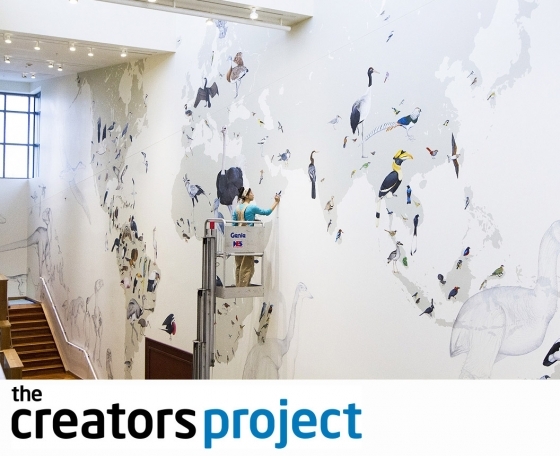 At 7:30 PM EST, artist Jane Kim will unveil The Marriage of Art and Science: A One-of-a-Kind Mural of Birds, the "only mural in the world depicting all 243 families of modern birds (and 28 dinosaurs and pre-pre-pre-historic beasts) in one place" at the Cornell Lab of Ornithology. 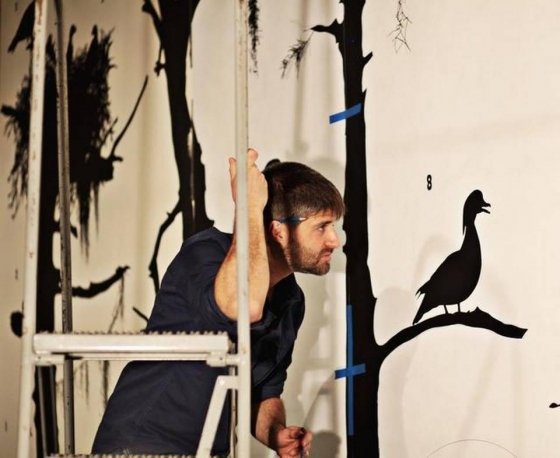 Spanning 375,000,000 years of avian evolution, the 70' x 40' mural took Kim two-and-a-half years to make, requiring theInk Dwell founder paint a mind-bending entire bird per day. Scientific illustration is already one of the most difficult artforms, requiring years of practice to hone—not to mention putting a bird on it is no cakewalk—so the fact that each bird is drawn to scale, from the miniscule marvellous spatuletail hummingbird, to the 30' Yutyrannus ("feathered tyrant") dinosaur, makes it all the more impressive. 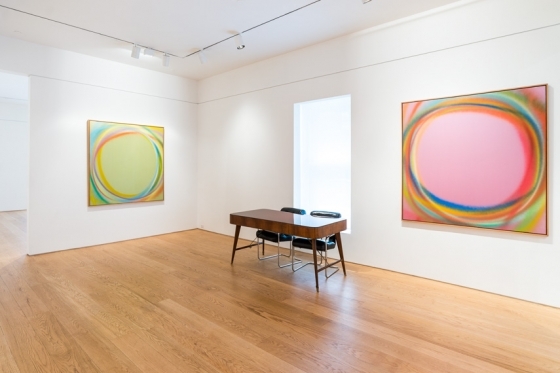 New York, NY (November 8, 2015) Color came streaming into the Leslie Feely gallery on East 68th Street early November as the gallery unveiled a 14-portrait gallery of works by painter, Jules Olitski. Jules works dominate the walls as he undergoes experiment with color and surface texture. The name of the exhibition, "A Decade of Innovation," certainly lives up to it's name. In his abstract expressionism, each canvas is filled edge to edge with grand strokes, creating a simplistic portrait with a deeper texture, as the dry paint occasionally adds a physical dimension to what can be considered a flat surface. 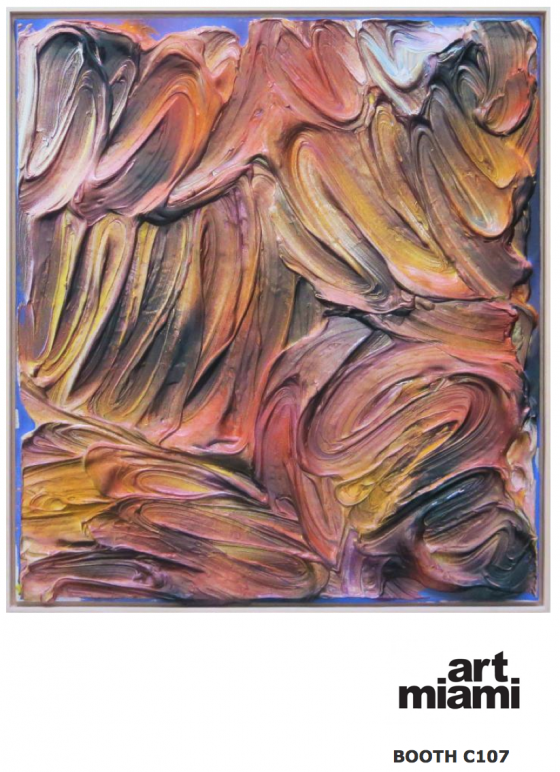 During this period, Olitski – an abstractionist born in Snovsk, but raised mostly in Brooklyn -- was moving on from his “spray” paintings of the later 1960s, but had not yet arrived at his “baroque” period of the 1980s, when he would lather on quantities of gel. Art Basel Miami is over, so you can finally start enjoying the most wonderful time of the year—and there's no better place than in New York. While you're busy running around buying last minute gifts, set aside some time for yourself to appreciate the artistic treasures of the city. The Upper East Side is definitely the place to be this time of year, especially Madison Avenue. 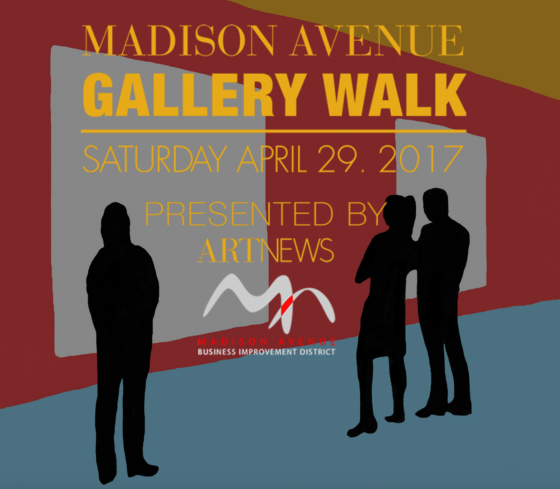 Maybe you associate the neighborhood with Mad Men or the cruel world of 1960s advertising, but put that aside and head uptown because the Upper East Side gallery scene is one of New York's better-kept secrets. 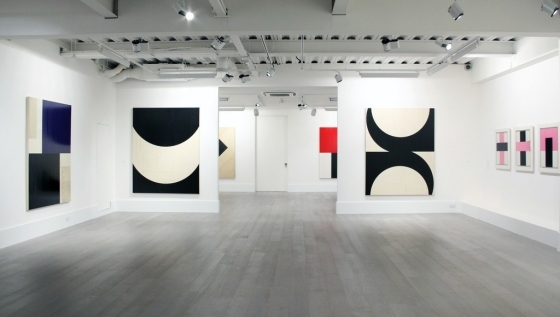 This is a rare chance to see a big collection of Friedel Dzubas’s big paintings. 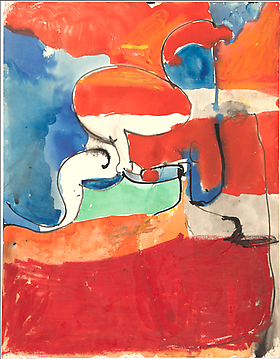 The German-born abstract painter (Who once shared a studio with Helen Frankenthaler) is known for massive, colorful compositions. 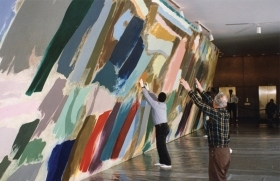 The biggest one, “Crossing” is believed to be the largest single painting on canvas in the world. Originally commissioned in 1975 for a Boston bank, the piece hasn’t been displayed since the bank closed in 1991. 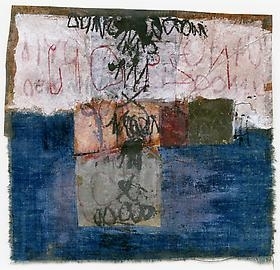 Apparently the curator searched for the artwork for over a year, tracing it to the collection of Bank of America. 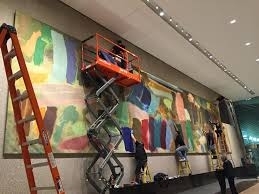 Now, “Crossing” and other monumental paintings will be on display in Tower 49’s lobby and 24th floor galleries. Leslie Feely is pleased to participate in Big Redux: Friedel Dzubas "Mural Paintings". “Dan Christensen: A Retrospective” a show at Berry Campbell (through October 17) drew scores of people to its opening reception, many of whom had to stand outside waiting in the street. 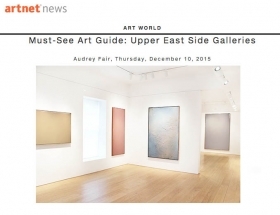 Since this is the inaugural exhibition of the gallery’s newly-expanded ground-floor space at 530 West 24th Street, it was particularly newsworthy, and I’ll get to that. But it is not the only, or even the best, show of the lyrical spray-painter’s work in New York right now. 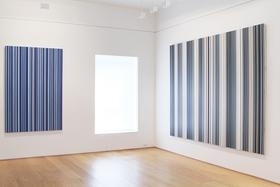 The back room of the Leslie Feely Gallery, at 33 East 68th Street, is currently showing “Dan Christensen: Paintings from 1970 to 1989”—which for me is the most perfect little art show at this moment in New York. 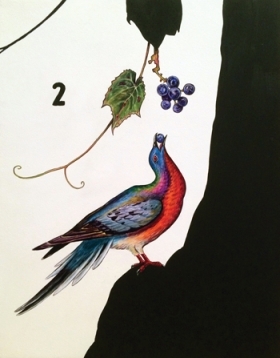 Summoning up John James Audubon, Carl Linnaeus, and venerable field guides, these imaginative reconstructions of flora and fauna by self-taught artist, naturalist, and author James Prosek offered a tantalizing mix of abstract and realistic art, art history, and science. 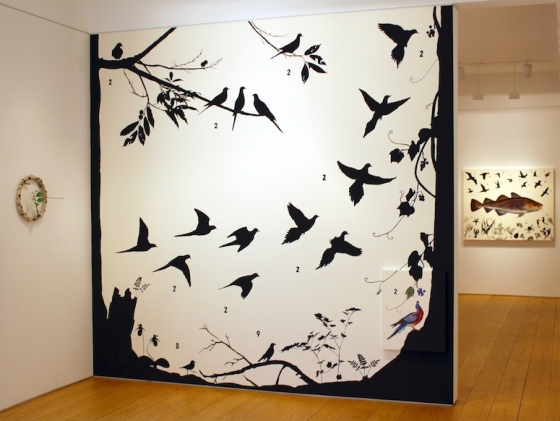 Perhaps the most eye-catching of Prosek’s works was the full-wall painting featuring black silhouettes of passenger pigeons, extinct since the early 20th century. 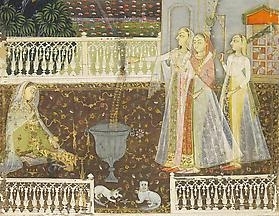 Attached to the painting was a small panel near the bottom right displaying the birds’ splendid coloration. The work reprised a much larger version. In addition, there were little numbers placed throughout the work, as if referring to information about the pigeons, but none was forthcoming. As she sat in a calm coastal environment, attempting to depict the incoming waves for a seascape, Cornelia Thomsen’s frustration was growing. 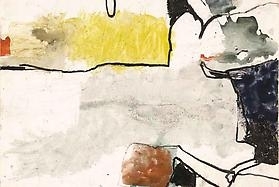 Try as she might, the East German-born artist just couldn’t seem to get it right. It was then that she had a moment of inspiration. Born in East Germany, Cornelia Thomsen now lives in New York. 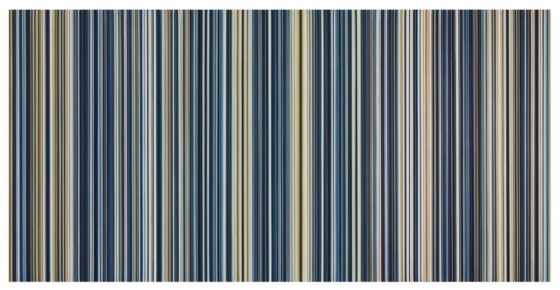 Her first exhibition in Japan features two contrasting series: the colorful "Stripes," inspired by seascapes, and the monochrome "Structures," expressing the essence of nature. 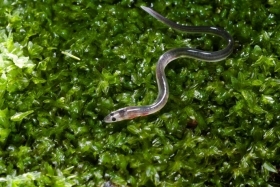 Eels are among the planet's weirdest, most mysterious creatures, but it's hard to get people worked up about their endangerment. The writer and artist James Prosek makes drawings of the fish he catches in order to enhance his powers of observation. Made an Honorary Royal Academician just a few months before he died, in 1993, it’s taken till now for a posthumous Royal Academy survey to finally bring one of the absolute greats of American postwar painting to a UK audience. 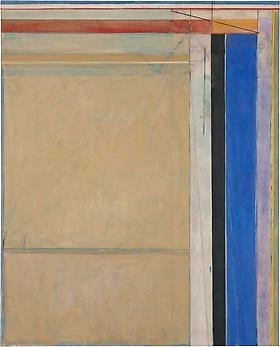 Richard Diebenkorn is one of America’s greatest post-war artists, yet he is comparatively little known in the UK. But that may be about to change thanks to the Royal Academy of Arts (RA) which has launched the first major survey of Diebenkorn’s figurative and abstract works in the UK in almost 25 years. 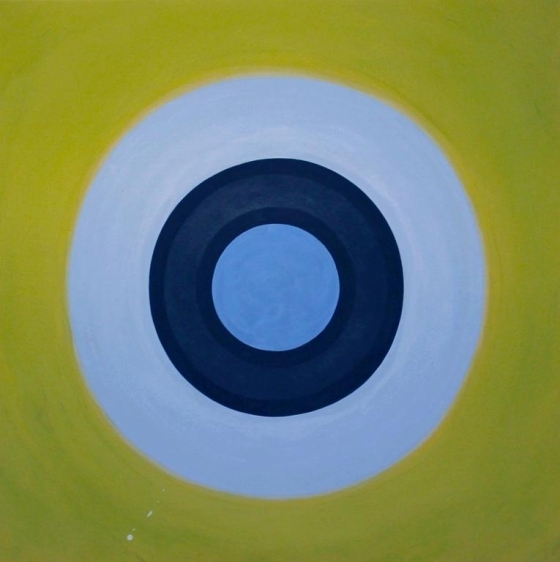 The work of author, artist, and Orion friend James Prosek has been on view around the country lately, in galleries and museums from Raleigh, North Carolina, to Washington, DC, and Ithaca, New York. His newest exhibit, “Walk in the Woods,” from which the images below are drawn, is currently on view at New York’s Leslie Feely Gallery until May 22. Prosek’s essay “The Failure of Names,” which explores a theme that carries into his latest work, appeared in the March/April 2008 issue of Orion. 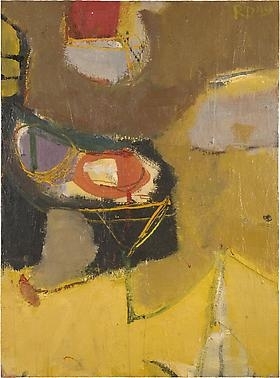 Robert Motherwell recounts that in 1951, Edna Wells Luetz, the newly appointed Chair of Hunter’s Department of Art, reached out to the Museum of Modern Art’s founding curator, Alfred Barr, in search of “a modern artist, and one who is articulate.” This marked the beginning of Hunter College’s commitment to artists as teachers, and to hiring artists fully engaged in the questions of the art of their time. 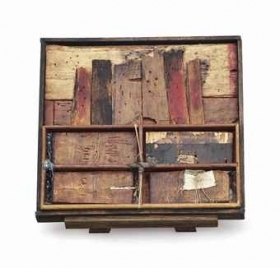 Barr recommended Motherwell, and at Motherwell’s urging, Luetz would bring to Hunter a number of artists associated with the New York School. 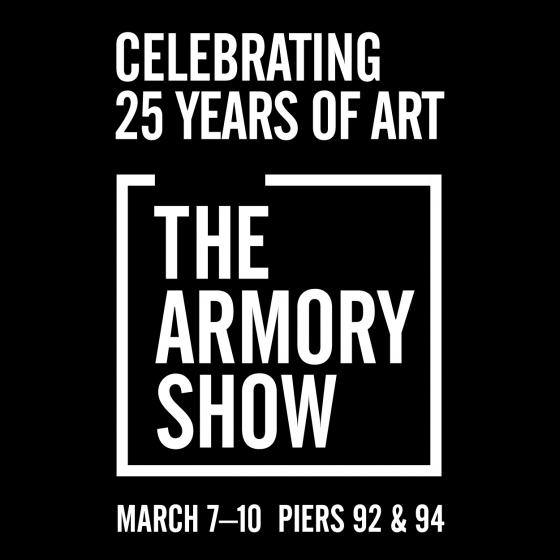 The artists included in this exhibition are William Baziotes, Fritz Bultman, Richard Lippold, Ray Parker, and George Sugarman. 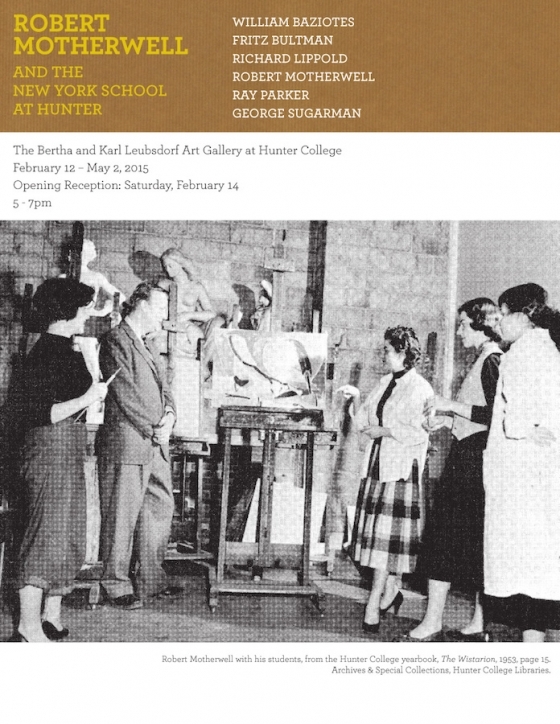 This remarkable cohort defined the fundamental aesthetic and professional ambitions of Hunter’s art department, and affirmed its commitment to creative practice. 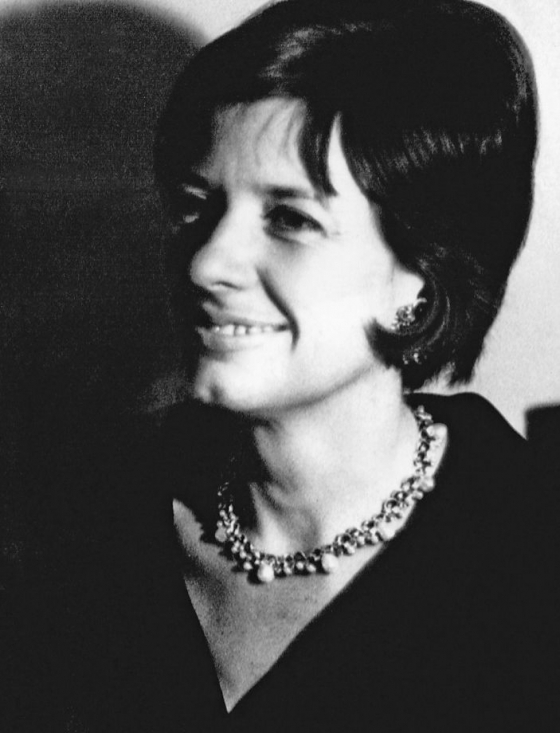 Phyllis Diebenkorn, the wife and muse of the famous painter Richard Diebenkorn, died Jan. 19 at her apartment in San Francisco. She was 93. 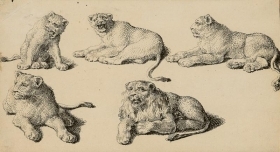 Leslie Feely is pleased to host Christopher Bishop Fine Art for Master Drawings New York 2015. 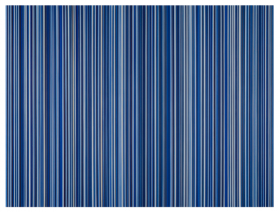 For sheer optical impact generated by an abstract painting, Barnett Newman’s Vir Heroicus Sublimis, 1950–51, is hard to beat. Photographs fail to capture the buzzing sensation behind one’s eyeballs when standing in front of the 18-by-8-foot canvas, whose rich red field is punctuated with the Abstract Expressionist’s signature vertical “zips.” And while Newman’s heavy, metaphorical language hasn’t withstood the test of time, his perceptual legacy is evergreen: artists from Op art to Scottish bad boy Jim Lambie’s psychedelic neon-tape floor patterns have attempted new ways to trick viewers’ eyes. 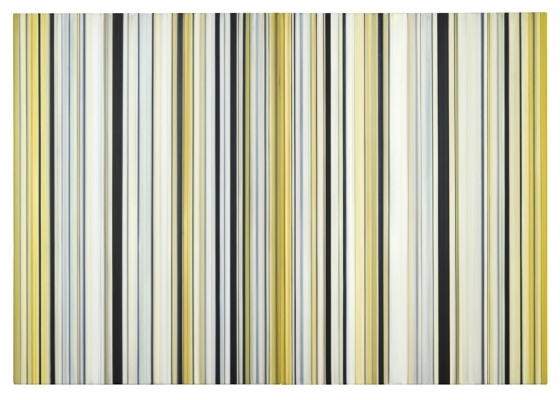 Normally, there’s a visually obvious distinction between figurative and abstract paintings. John Constable shows English landscapes, while Jackson Pollock’s large late-1940s abstractions depict nothing real. But it’s generally difficult to identify the subjects of Liliane Tomasko’s paintings. 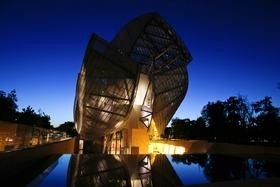 PARIS — In a cultural twofer that makes it Frank Gehry week here, the Louis Vuitton Foundation, a private cultural center and contemporary-art museum designed by Mr. Gehry, had its official inaugural ceremony on Monday, attended by the French president, François Hollande. At the same time, the Pompidou Center across town is giving Mr. Gehry, based in Los Angeles, a major career retrospective, his first in Europe. 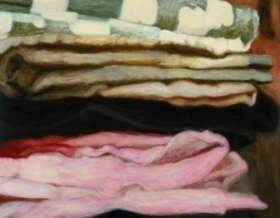 “You have to get close, then move back, slowly,” I tried to explain to a motley group of graduate students whom I asked to see the recent paintings and drawings by Cornelia Thomsen at the uptown Leslie Feely gallery. 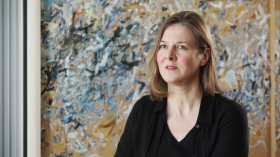 This highly original hard-edge painter and soft-edge draughtswoman has produced one of the more interesting exhibitions involving color, line, and form in the current enterprise of abstract painting. 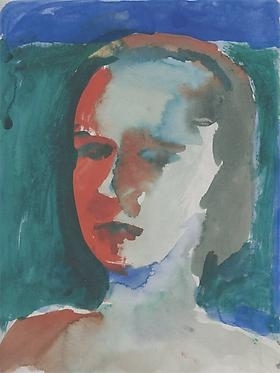 Her pictorial images, which are a compendium of layers of color involving time, intuition, and pressure from hand to surface, appear to have their own point of view rather than conforming to the current look of abstraction, which, given the plethora of art media today, already has begun to appear repetitive. 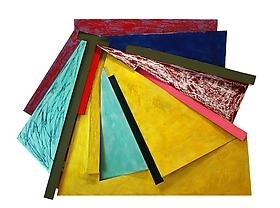 A selection of works by Frank Stella from 1971 to 1987 will be on view at Leslie Feely from May 8 to June 27, 2014. "I was able to use my gift for structure with something that modernism hadn't really exploited before, the idea that paintings could be constructed, made by picture-building...Building a picture was something natural for me. Build it and then paint it. It was a job I was well suited for." 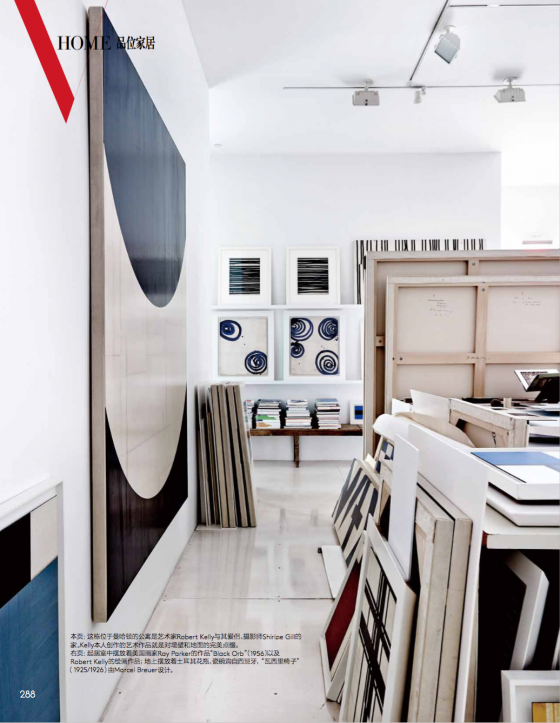 - Frank Stella quoted in William Rubin ed. 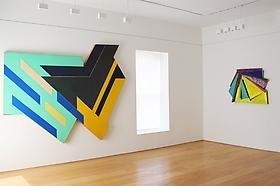 Frank Stella: 1970-1987 (New York, 1987), p.40. 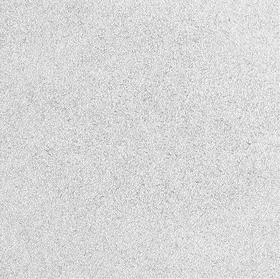 The Estate of Hannelore Baron announces a new website. 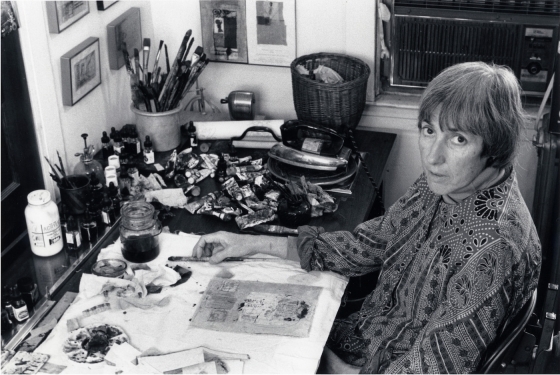 In conjunction with the opening of this exhibition, Gretchen Diebenkorn Grant, the artist's daughter will present an illustrated lecture on her fathers work. 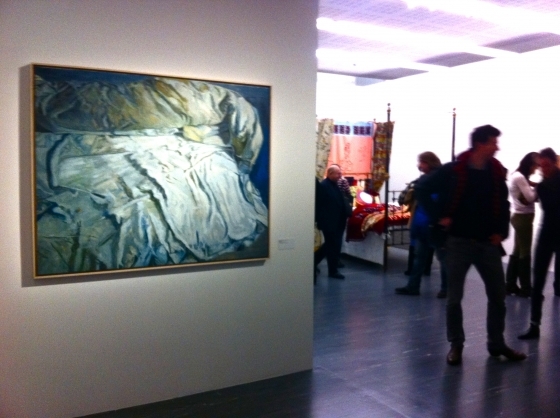 ARTnews reviews Leslie Feely's Hannelore Baron show. Click "View More" below to read. 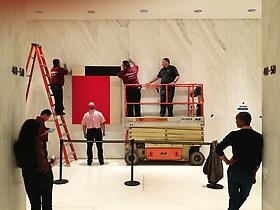 Stop by 767 Fifth Avenue to view this new Robert Kelly installation on view in the lobby. Covering the five decades of painter Jules Olitski's career, this exhibition presents 30 large-scale paintings drawn from public and private collections and intended to highlight the artist's essential periods and themes of creation. Initially staged at the Kemper Museum of Contemporary in Kansas City, the show's additional venues included Houston's Museum of Art as well as The Toledo Museum of Art in Ohio. 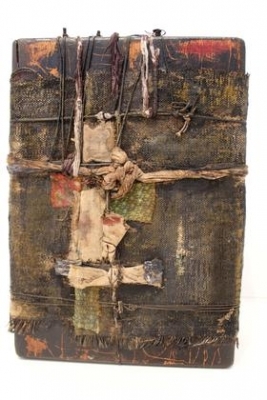 It concludes in Washington, D.C. at the American University Museum at the Katzen Arts Center, opening September 15th and running through December 16, 2012. 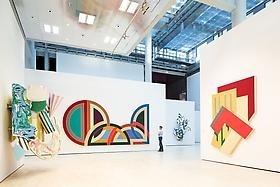 Kunstmuseum Wolfsburg hosts a Frank Stella retrospective through January 20, 2013. In part a celebration of the artist's 75th birthday, the show boasts drawings, sketches, and architectural models in addition to numerous large-scale works, and offers a unique viewing experience as well—Stella staged the exhibition himself, making the most of the museum's customizable, flexible wall system. This presentation attempts a comprehensive overview of Stella's influential career thus far, and—for the first time—a broader contextualization of that work beyond the boundaries of modernism. Performed with the Los Angeles Philharmonic, Mozart’s Don Giovanni shares the tale of a promiscuous nobleman and his eventual downfall to the throngs of Hell for his wrongdoings. Frank Gehry, who, in 2003, designed the Disney Concert Hall where Don Giovanni is being shown, was asked to construct the opera set which is paired with the costume design of sisters Kate and Laura Mulleavy of Rodarte. 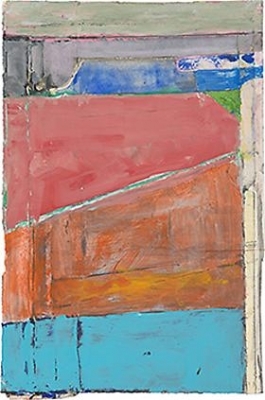 This retrospective of Diebenkorn's most celebrated and largest body of work opened September 2011 at the Modern Art Museum of Fort Worth before traveling to the Orange County Museum of Art. 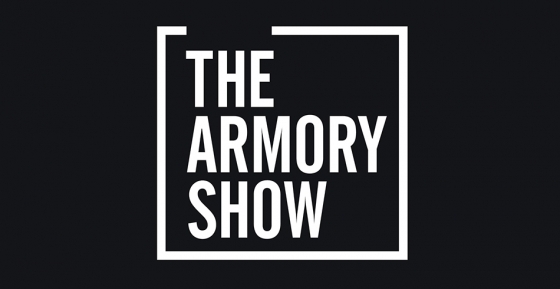 It soon commences its third and final stop at Washington D.C.'s Corcoran Gallery of Art, where it will run from June 30-September 23, 2012. The exhibition showcases more than 80 paintings, prints, and drawings spanning the two decades Diebenkorn dedicated to this series. Representing a stylistic transformation from his previous figurative practice to monumental geometric abstractions, these pieces capture a sense of the Ocean Park community of Southern California where the artist created them between 1967 and 1988. 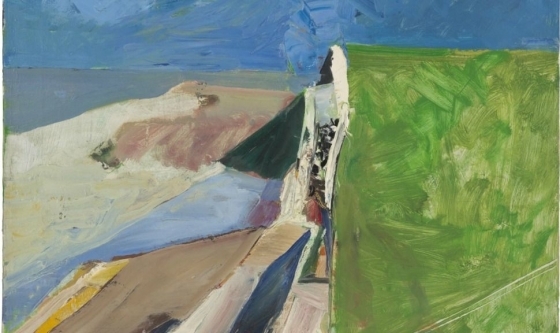 The show highlights the previously unrecognized depth of the Ocean Park works, offering an unprecedented demonstration of Diebenkorn's artistic evolution and experimentation within this series. 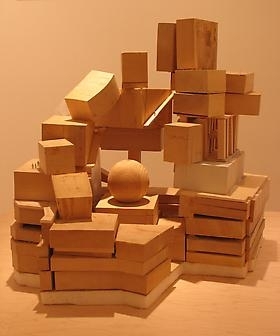 Unique process models by world-renowned architect Frank Gehry will be exhibited in the booth of New York dealer Leslie Feely at Art Basel Miami Beach, December 1st through 4th. 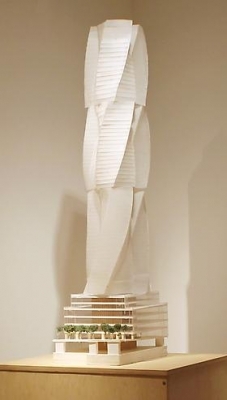 Frank Gehry was the buzz at Leslie Feely Fine Art. 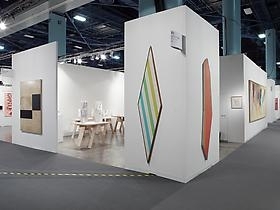 The superstar architect, whose design for the New World Center on Miami Beach in January was the first arts highlight of 2011, is famous for the models he makes of works in progress -- but they’ve never been for sale. 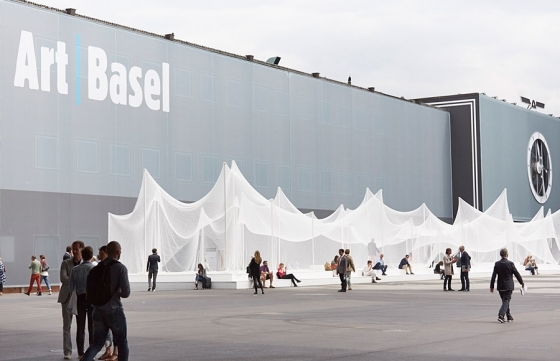 Feely brought 15 of them to Basel -- priced from $25,000 to $120,000 -- and several were already gone Thursday afternoon, and multiple reserve bids for others. 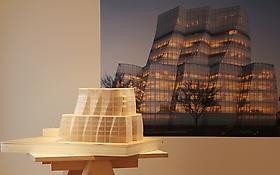 Four years ago, Feely held a gallery show of museum models by Gehry, who is a friend. "He’s very attached to the models," she said. "’He said, ’You can’t sell any of them.’" But thinking about his family’s long-term ability to conserve such a extensive collection has swayed him, said Feely, chatting with Susan Kronick and Edward Shumsky, who met the architect during construction of New World Center and vouched for the size of Gehry’s "archive." 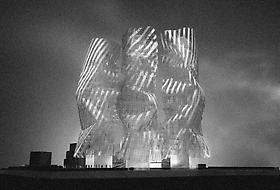 Gehry is expected to be in town for the show on Friday. "Miami is a place he’s very comfortable in," Feely said. Faye Hirsch covers "Bella Pacifica: Bay Area Abstraction, 1946-1963," noting the "tour de force" works on view at Leslie Feely. 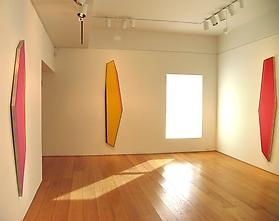 Leslie Feely show "Jules Olitski & Anthony Caro; Making Art as Naked as Possible, 1964-1978" reviewed by Piri Helesz. Read an excerpted transcription here. 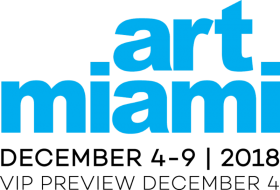 Leslie Feely Fine Art is pleased to announce our inaugural participation in Art Basel Miami Beach. Cynthia Nadelman reviews in ARTnews two shows highlighting Richard Diebenkorn, including "Richard Diebenkorn in Context: 1949-1952." 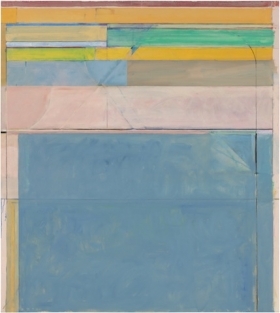 Roberta Smith reviews our exhibition "Richard Diebenkorn in Context: 1949-1952." 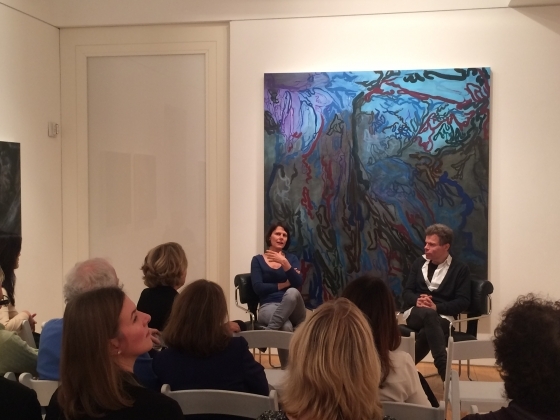 Leslie Feely's exhibition "Richard Diebenkorn in Context: 1949-52" covered by John Goodrich of cityArts. 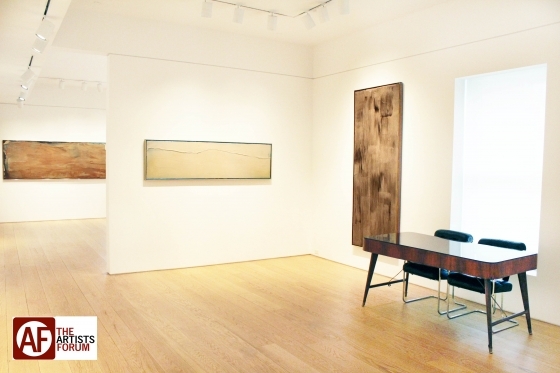 NEW YORK, NY Leslie Feely Fine Art is presenting an exhibition of paintings, drawings and sculpture from Richard Diebenkorn’s Albuquerque period. In this precise and jewel-like exhibition, important Diebenkorns from the artist’s estate are seen with examples from his contemporaries which include de Kooning, Gorky, Gottlieb, Guston, Motherwell, and Smith. 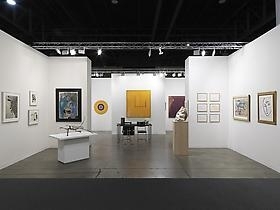 In addition to a very rare sculpture, the show features paintings and a number of seminal works on paper, several of which have never been exhibited. 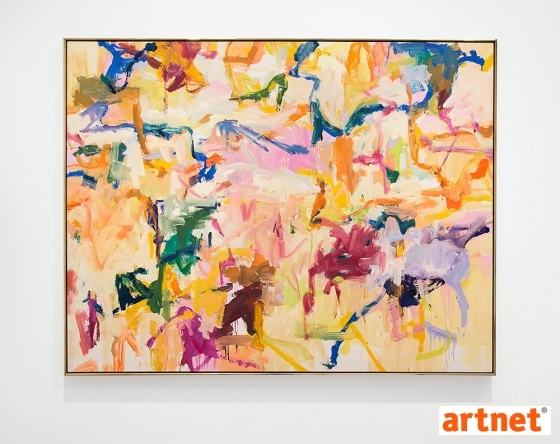 Other included works were previously shown in the Museum of Modern Art exhibition, The Drawings of Richard Diebenkorn, and the Whitney Museum’s historic Diebenkorn retrospective, The Art of Richard Diebenkorn. 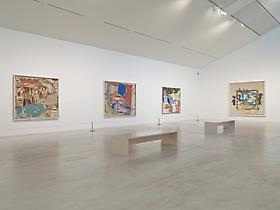 Diebenkorn is frequently placed critically alongside rather than among New York-based artists of comparable stature. 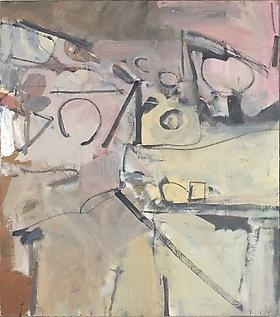 Richard Diebenkorn in Context: 1949 - 1952 attempts to refine that perception. The works he created during this time show an immediate and masterful response to the most experimental work of the time and the degree to which those works informed his own development. Piri Halasz praises a number of inclusions in this group show, on view through April and including works by Noland, Olitski, and Dzubas, among others. 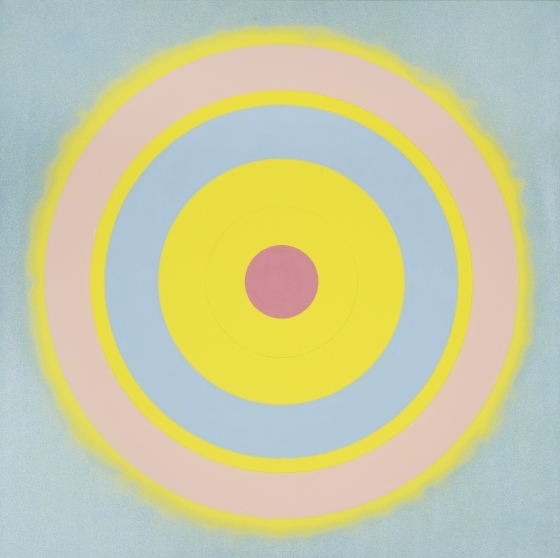 The Feely gallery and its show "Kenneth Noland: Shaped Paintings: 1981 - 82" are mentioned in this article citing increased demand for Noland's works. 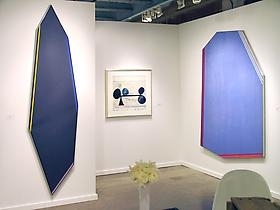 Leslie Feely Fine Art is pleased to announce its participation on the first annual Dallas Art Fair, February 6-8, 2009. 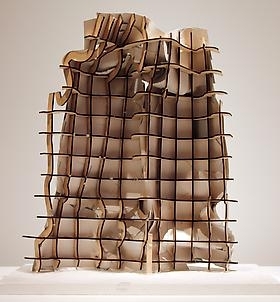 Daniel Kunitz reflects on the singularity of Gehry's models, discovering that they surpass his typical expectations that architectural models are ill-suited to gallery display. 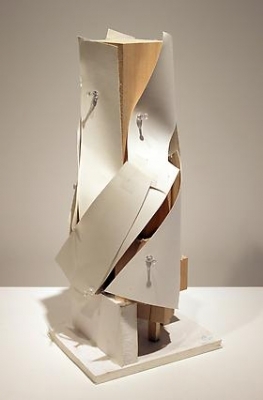 Instead, Kunitz finds this exhibition to not only shed light on Gehry's mental processes and working practices, but also to enhance viewer's understanding of Gehry as a sculptural architect.